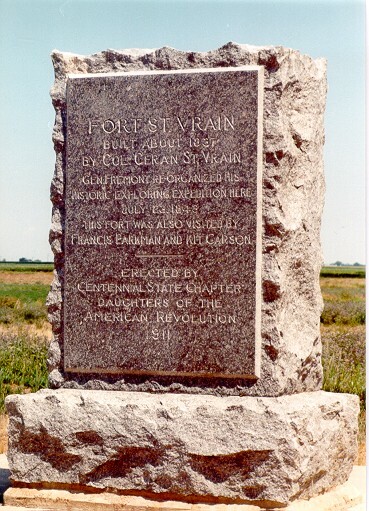 Built by Ceran St. Vrain and the Bent brothers in 1837 near present day Platteville, Colorado, St. Vrain's Fort was a major trading post on the Platte River until 1848. The fort was built in the likeness of Bent's Old Fort near La Junta, Colorado and remained a destination and landmark for many years. It was the site of the first post office and first courthouse for what would become Weld County, Colorado. Unfortunately, the fort was allowed to fall into ruins and by 1951 so little was left, the site was leveled for farming. The monument shown here and a one-acre plot are all that remain today. Portions of this website are Copyright 2000-18 by R.S. "Joe" Pinner and others. Please secure permission, in writing, from the webmaster prior to copying items from this website. A book about Fort St. Vrain! Click here to learn more.